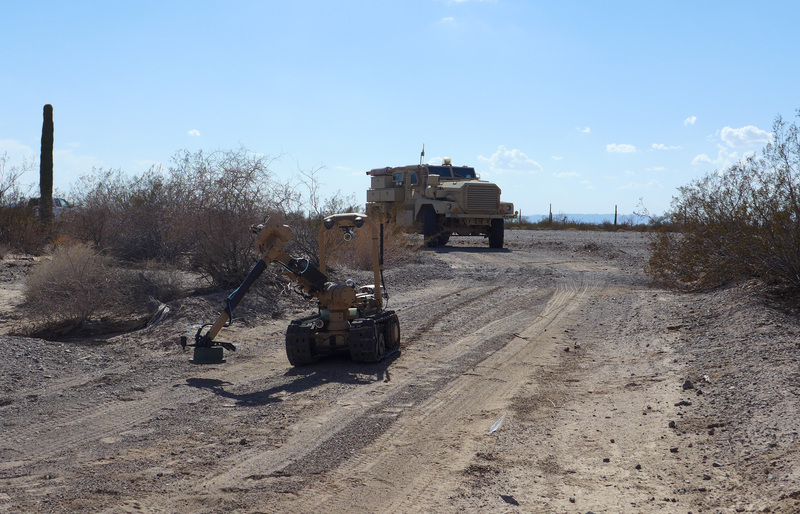 PM CCS is using robots to detect, mark and neutralize explosive hazards while keeping Soldiers at a safe distance. Searching for explosive hazards with handheld mine detectors can be both physically and mentally taxing. Explosive hazards can be buried underground, laid on the ground or placed flush with the ground’s surface. There are a variety of techniques to emplace them, including scattering the devices on the ground or delivering them by vehicles or helicopters. 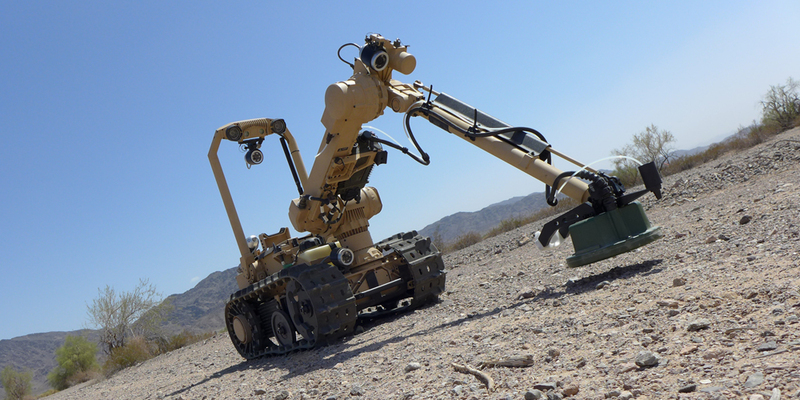 The Project Manager for Close Combat Systems (PM CCS), within the Program Executive Office for Ammunition, has partnered with Carnegie Robotics LLC, a cutting-edge manufacturer of advanced robotic sensors and platforms, to pursue integration of sensors for detection and neutralization technology onto a robotic platform. The Army is moving quickly to provide Soldiers with this platform, known as the Standoff Robotic Explosive Hazard Detection System (SREHD). SREHD is capable of detecting, marking and neutralizing explosive hazards—landmines, improvised explosive devices and unexploded ordnance—without requiring Soldiers to endanger themselves while operating the system. SREHD can be used in confined areas to support full-spectrum military operations, the simultaneous and continuous combination of offensive, defensive, stability and civil support operations. It provides freedom to maneuver on the battlefield as well as the layer of protection Soldiers need to precisely detect, mark and neutralize explosive hazards so that they can carry out missions as planned, without interruption and with a lower risk of injuries. This semiautonomous system combines new and existing modular capabilities integrated onto an unmanned ground vehicle. The Soldier stays out of harm’s way while he or she is focused on clearing explosive hazards. 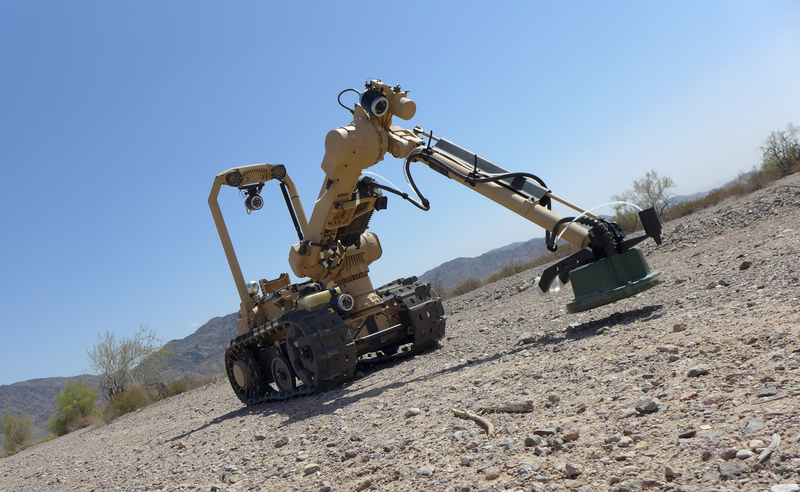 SREHD is integrated with TALON IV robotic platforms, which are maneuverable on rough terrain. The system uses state-of-the-art stereoscopic, 3D imaging that accurately determines distances and elevation between objects. The stereo camera provides obstacle avoidance to ensure that SREHD does not go over a cliff or hit a rock during detection. This allows the system to maneuver through complex terrain—urban or rural, irrigated or unirrigated—with minimal input from the operator. SREHD is an important step toward providing today’s Soldiers with tomorrow’s technology. 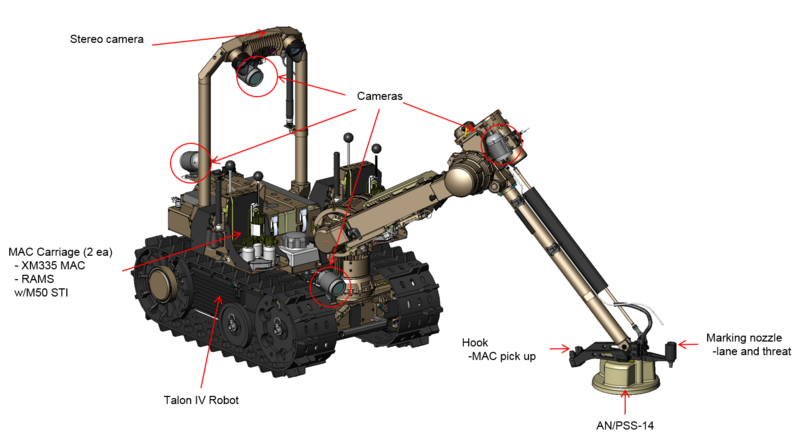 The development and use of semiautonomous robotic systems such as this one will lead to more advanced, fully autonomous robots that Soldiers can leverage in the future. The requirement for SREHD dates to 2009, when the U.S. Army Maneuver Support Center of Excellence identified a capability gap: a way to protect Soldiers conducting detection and neutralization missions. Explosive hazards present a multitude of challenges to the Soldier in terms of operational tempo, extensive exposure to potential enemy fires and vulnerability to secondary attacks. In addition, explosive hazards are often found in areas where only handheld detection techniques can be used, further increasing the risks Soldiers face. Standoff capability provides the protection Soldiers need while they perform tasks such as clearing vehicles at chokepoints, roadsides and intersections. 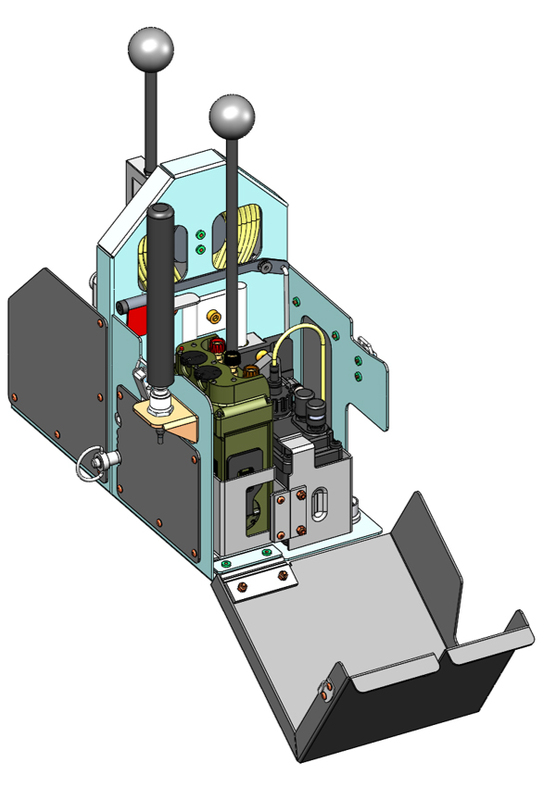 The Remote Activation Munitions System (RAMS), a secure, radio-controlled system to remotely initiate demolition charges. Ground-penetrating radar (GPR), a technology that provides 3D analysis of objects buried in the ground. Electromagnetic induction (EMI), metal detection and neutralization that renders explosive hazards incapable of detonating on a target. SREHD is also integrated with the Army’s program-of-record handheld explosive hazard detector, the Army-Navy/Portable Special Search (AN/PSS)-14. The AN/PSS-14 is a portable, battery-powered, lightweight detector that uses both the GPR and EMI sensors. The system, operated by one person, is designed to locate a variety of mines. It provides SREHD with GPR and metal detection, and the munition array charge integrates with RAMS to neutralize the hazard. A challenge with handheld detectors is their false alarm rate. EMI handheld detectors encounter about 200 false targets to every antipersonnel mine. For the GPR handhelds, clutter within or on the surface of the ground poses a major problem—electronic and physical rubble and other obstructions can cause false alarms. Instead of seeing a clear image of an explosive on the threat map of the operator control unit (OCU), the operator sees a lot of red dots or specks that make it difficult to find the real explosive on the screen. Clutter can completely obscure the buried explosive hazard, which makes searching with handheld mine detectors not only grueling but life-threatening. PM CCS has developed SREHD to alleviate some of these physical and mental demands. The Army is currently investigating technology for a new GPR with the ability to detect hazards across a larger area and at greater depth, faster and with better signal-to-noise ratios and improved user interface displays. Explosive hazards have been a constant danger to Soldiers during conflict and to innocent people years after conflicts end, causing thousands of deaths and injuries each year. SREHD provides multiple lifesaving improvements over handheld mine detectors, such as standoff capability, visual and audio detection through the use of an OCU, closer-to-pinpoint accuracy in detecting landmine locations, reduced operator workload and decreased training requirements. The OCU is a vital component of the system, and is the only interface between the operator and SREHD. The SREHD OCU has a display tablet, computer and radio, and allows the operator to switch among different screens and views. In addition, the tablet allows the operator to maneuver SREHD and see where it is going through the use of both stereoscopic imaging and conventional cameras. Intuitive and easy to use, the OCU makes training on the SREHD faster than the training required for some other types of explosive hazard equipment. The marking capability of SREHD is a unique and critical capability that helps operators identify the locations of potential explosive hazards during breaching and clearing operations. The system uses a blue highlight-marking chemical to mark a suspected explosive hazard and enable effective neutralization. Marking the explosive hazard gives every person involved situational awareness of where hazards are and improves efficiency by reducing the amount of rework—because it eliminates the need to search again when shifts change and new Soldiers arrive. SREHD is, in sum, a safer system for keeping the Soldier and the platform out of harm’s way. Handheld detectors lack marking and neutralization capabilities, so a single error or failure to detect a hazard jeopardizes the Soldier engaged in the countermine operation. Furthermore, loss of proficiency occurs when there is an extended period between original training on new countermine equipment and operational use. In the near future, Soldiers will be able to train on SREHD in both virtual and physical environments across many scenarios, meaning more frequent training. The training will simulate explosive hazard removal with the operator using a laptop computer or will be conducted live using the OCU with the robot. Nothing is more important than the freedom to safely operate and conduct missions wherever required on the battlefield. Standoff capability is important because it allows operators to detect, mark and neutralize explosive hazards while enabling the Soldier to remain in a defensive posture and evade potential threats such as direct enemy fire. It also relieves other Soldiers from providing additional security for clearance missions. Detecting, marking and neutralizing explosive hazards that impede movement demand a complete spectrum of countermine solutions that is currently unavailable. SREHD will meet this need. The system has completed thorough product qualification testing at Yuma Proving Ground, Arizona, and has performed well in each of its key performance parameters: system and cyber survivability, training, transportability, detection, marking and neutralization. Upcoming events for SREHD include milestone C approval by July 2017, low-rate initial production throughout the first half of FY18, and initial operational test and evaluation during the second quarter of FY19. For more information, contact Maj. Lendrick James at lendrick.y.james.mil@mail.mil or go to the PM CCS website at http://www.pica.army.mil/pmccs/MainSite.html. MAJ. LENDRICK JAMES is an assistant product manager assigned to PM CCS’ Product Director for Combat Armaments and Protection Systems, Picatinny Arsenal, New Jersey. He holds an M.S. in management from Embry-Riddle Aeronautical University, an M.A. in general studies from the U.S. Army Command and General Staff College and a B.A. in political science from South Carolina State University. 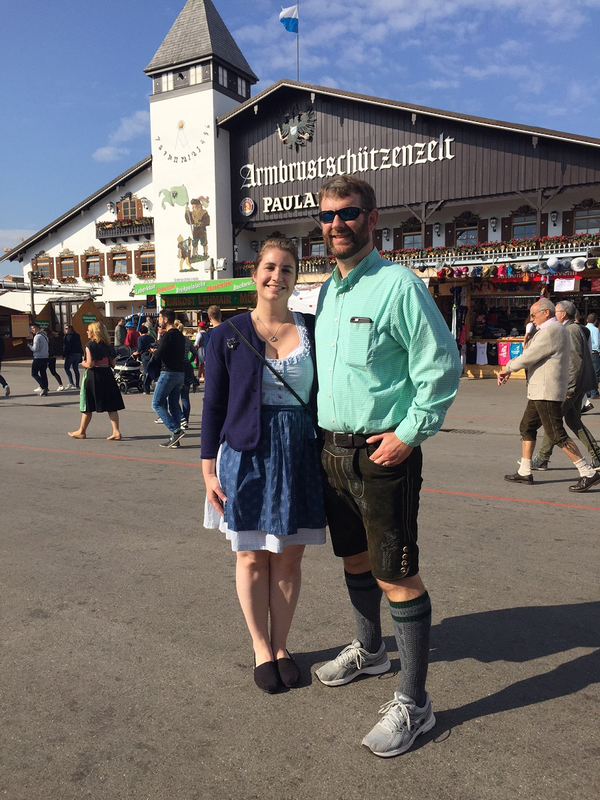 He is Level III certified in program management and an Army Acquisition Corps (AAC) member. MR. KWAI-FUNG CHAN is an electrical engineer at the U.S. Army Armament Research, Development and Engineering Center, Picatinny Arsenal. He holds a B.E. in electrical engineering from The City College of New York. He is Level III certified in science and technology management, and has been a member of the AAC since 2004. This article is scheduled to be published in the April – June 2017 issue of Army AL&T Magazine.